Good things can come from being bad. For the Pittsburgh Pirates, a long string of futility meant some key draft picks. One of the biggest in recent years for the franchise is Gerrit Cole, the first overall pick in the 2011 draft. After just one full season in the minors, he got his call to play for the Pirates. The hard-throwing starter is another piece in the Pirates' quest to be a consistent winner once again. Shop for Gerrit Cole cards on eBay. As a pitcher, there is some risk in Gerrit Cole cards. While many make their way to the majors with a lot of hype in the hobby, few find a lasting, mainstream presence with collectors. It's still very early to see where Cole fits, although his rise, even as a top pick, hasn't been met with hobby hysteria. 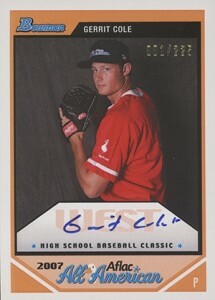 At the time of his debut, Gerrit Cole already had hundreds of different baseball cards. The majority of these feature him as a member of the Team USA squad. While none of the Gerrit Cole cards released between 2009 and 2012 are official rookie cards, there are still many great options. 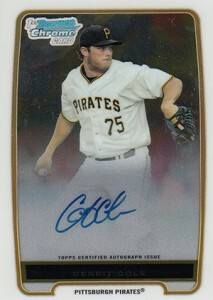 Now that he has pitched for the Pirates, collectors can expect Gerrit Cole rookie cards in late-2013 products. Click on the card names to shop for singles on eBay. Upper Deck spread a bunch Gerrit Cole cards in a handful of 2009 products. All of them focus on his spot with USA Baseball. Some are rare, other are plentiful. This particular card offers both an autograph and a jersey swatch but is plentiful enough that the price remains reasonable. A lot of collectors connect with the Future Watch branding as well. While Cole is still in his Team USA uniform, this is his first in a MLB-licensed set. With collectors' love of all things Bowman Chrome, this is a solid, reasonably priced card. It also has several numbered Refractor parallels. Delivering an autograph (albeit a sticker), a game-used jersey swatch, Refractor finish and a healthy numbered print run, this one has a lot of the things many collectors look for in a modern card. 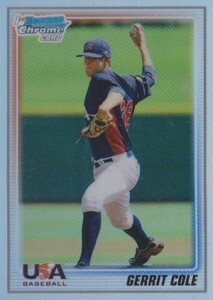 Another 2010 USA Baseball card from Topps, this one is found in packs of 2010 Topps Chrome Baseball. As far as posed portraits with plain backgrounds go, this is a very solid card. The on-card signature is a definite plus. 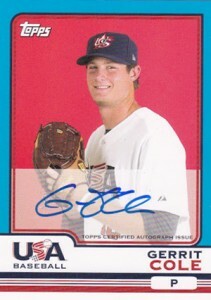 The 2010 Topps USA has several different Gerrit Cole autographs and memorabilia cards. While limited to 50 copies, this one can still be found for relatively reasonable amounts. The patch pieces make it more appealing than other cards that have plain jersey swatches. It may not have any logos, but the 2011 Donruss Elite Extra Edition Gerrit Cole does boast an on-card autograph and a serial number. 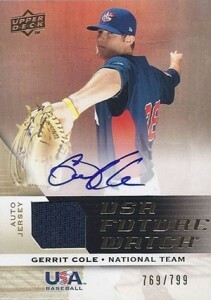 It's also one of the first cards available of the pitcher after being drafted. While not licensed by MLB, 2011 EEE is recognized by the MLBPA. 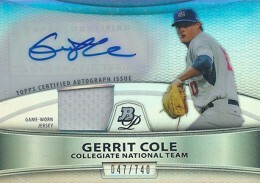 The 2012 Bowman AFLAC Autograph is far from the most attractive Gerrit Cole card out there. Something that's notable about it is that it was actually produced and signed in 2007. This makes the signature a very early one from the pitcher, one that has changed dramatically in the ensuing years. Topps produced AFLAC cards at the event, doing everything from the photography to the printing to the signing all within a short period of time. 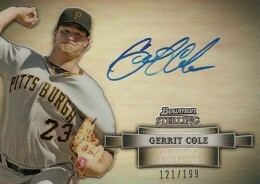 2012 Bowman Baseball has the first Gerrit Cole cards of the pitcher in a Pirates uniform. While there's a basic Bowman Prospects card, the basic Bowman Chrome version is affordable enough that it's by far the better option. 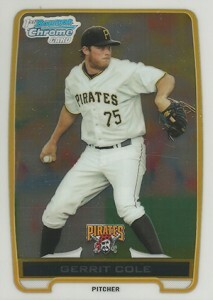 Officially, it's not a rookie card but that doesn't stop it from being one of the most widely traded Gerrit Cole cards. And yes, the "1st Bowman Chrome Card" should have "in a Pirates Uniform" added to the end, but that would look and sound strange. 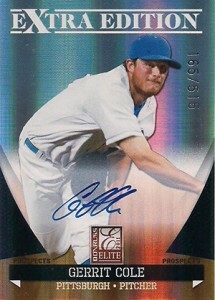 The 2012 Bowman Chrome Prospect Autographs Gerrit Cole is likely to become the pitcher's top card. While somewhat pricey, it's also the most coveted. If you've got the budget, the numbered Refractors are also extremely popular. It's strange that while Bowman Sterling is much more costly than the regular Bowman and Bowman Chrome products, Sterling autographs often don't carry the same amount of clout. That may turn off some. For others, it can be seen as an opportunity. Like the Bowman Chrome autograph, this one has an on-card signature as well. Some may think the design is more appropriate for an autograph as well. i have a 2011 donruss elite–ext edition–best compared to strasburg–garrit cole–auto 06/25 cannot find listing on Beckett anywhere–any suggestions?